The Quest Team Paranormal Investigations Forum Quest Team Paranormal • View topic - 1080p HD Camcorder: Cleveland Paranormal Supply Inc.
1080p HD Camcorder: Cleveland Paranormal Supply Inc.
World's only 1080p camcorder that switches to infrared or Full Spectrum mode with a push of a button! No external filters needed! This professionally modified 1080p HD Camcorder can be used as a regular camcorder, then turn on the built-in infrared light and switch into "IR MODE" similar to Sony NightShot models. 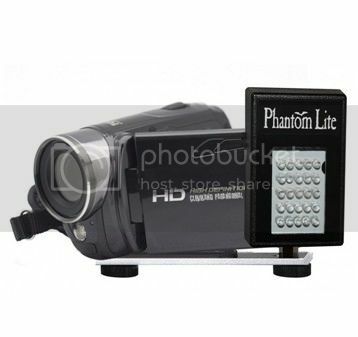 However, our custom firmwares allow this camera to go one step further than any other camcorder available today. This camcorder also has a "FULL SPECTRUM MODE" that enables sensitivity to Ultraviolet, Visible, and Infrared light. Three seperate modes of operation: Regular Camcorder, IR Mode, and Full Spectrum Mode. The Built-in Infrared LED allows for approx. 5 feet of night vision that is good for very small rooms. An external infrared or full spectrum light is always recommended. •	34MM Filter thread to accept external filters or wide angle lenses. •	Can work from external power only for static night vision use by using a standard cell phone USB charger (not included) and the included USB cord.